It may seem as if brides have been getting married in white forever, but this is not the case. The trend of wearing an all white wedding dress dates back to royalty of Victorian times. Before that, brides wore their best dress. The color and materials of the dress varied depending on a woman's social status. Even though colors and styles have changed throughout the years, brides have always dressed in their best for the occasion. Royalty and those with a high social standing always dressed at the height of fashion, sparing no expense. Those who had limited means still treated a wedding as a special occasion and dressed as formally as their budgets allowed. In ancient Rome, bride wore yellow veils that represented them as a torch and symbolized warmth. In ancient Athens, bride were likely to wear long robes in shades or red or violet. In the Zhou Dynasty (approximately 1046-256 BCE) in China, bridal garments were black with red trim. During the Han period, black garments were worn, and during China's Tang Dynasty (approximately 618 to 906 A.D), clothing edicts had become less strict, and it was fashionable for brides to wear green. Traditional Japanese brides wore several different colored kimonos on the wedding day. 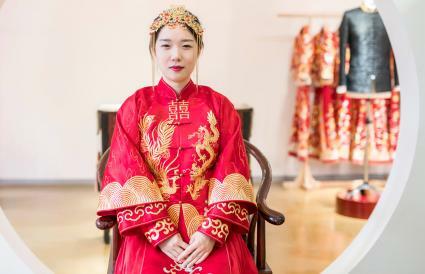 In Korea, the bride's clothing tradition was to emulate royalty, which may have been an elaborate top with long sleeves in multiple colors such as blue, red, and yellow in silk. During Medieval times (5th to 15th centuries), the wedding was still more than just a union between two people. It often represented a union between two families, two businesses and even two countries. Weddings were often arranged and more a matter of politics than love. A bride had to dress in a manner which cast her family in the most favorable light, since she wasn't only representing herself. Medieval brides of an elevated social standing wore rich colors, expensive fabrics and often had gems sewn into the garment. It was common to see well-to-do brides wearing boldly colored layers of furs, velvet and silk. Those of a lower social standing wore fabrics that weren't as rich, though they copied the elegant styles as best they could. Wedding Dresses in the middle ages could be of several shades - blue was popular because of its association with purity, but dresses could also be red, yellow, green, or another shade. Long dresses that went from the shoulders or neck to the feet, possibly with a train. Corseted dresses and skirting done in a bell shape. Burgundy was a popular color for brides during this time period. Throughout the years, brides continued to dress in a manner befitting their social status; always in the height of fashion, with the richest, boldest materials money could buy. 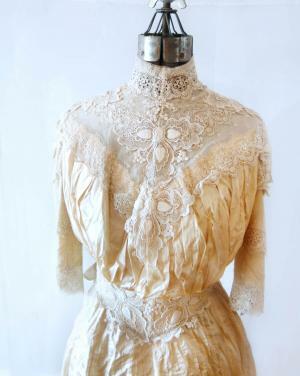 Best owned - Up until Victorian times, the average bride, did not usually buy a new dress but wore the finest they owned. The poorest of brides wore their church dress on their wedding day. Material - The amount of material a wedding dress contained was a reflection of the bride's social standing. For instance, the more sleeves flowed, the longer the train, the richer the bride's family was apt to be. The materials would also continue to reflect the bride's social status or level of wealth, For example, Elizabethan brides that were upper class may wear satin, velvet, or cordouroy, while lower-class brides may have we in flax, cotton, or wool. Prior to the reign of Queen Victoria (1837-1901), it was not common for women to wear a white wedding dress. Although there were a few exceptions, such as Mary Queen of Scots (who wore a white dress to her wedding in 1558), women typically wore other colors, which could have included blue, red, yellow, green, or even grey. In 1840, Queen Victoria married Prince Albert of Saxe wearing a white wedding gown. In those days, white was not a symbol of purity, blue was. In fact, many women chose the color blue for their wedding dresses for specifically that reason. White, on the other hand, symbolized wealth. Because her dress was made with handmade lace, Victoria chose white because it was perfect color to highlight her extraordinary gown. Since white wasn't generally chosen as the color in which to be married, Victoria's dress came as quite the surprise. 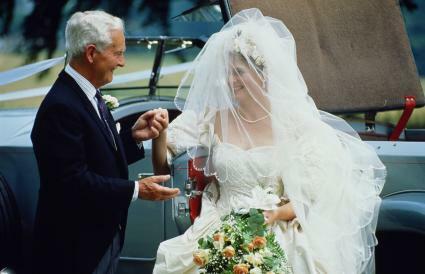 It wasn't an unpleasant surprise, however, because soon after women of elevated social status all over Europe and America began wearing white wedding dresses as well. 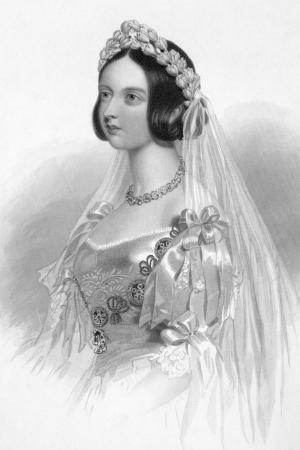 Even though there were occasional examples of other women wearing white before her, Queen Victoria is credited with beginning the popularity of the white wedding dress. Some women still chose to get married in other colors, but the trend toward white was established after Queen Victoria's wedding. Once the trend towards white was established, it continued to grow. Although styles changed through the years, a white dress became the norm for wedding dresses in the West. By the turn of the century, the Industrial Revolution made it possible for more brides to buy a new dress for their wedding day and white was the color of choice. The emergence of railroad travel influenced wedding dress styles, with some having narrower skirts. These dresses followed the trends and style of their day and continue to do so a century later. The most prevalent wedding dress color in Europe and America is still white. 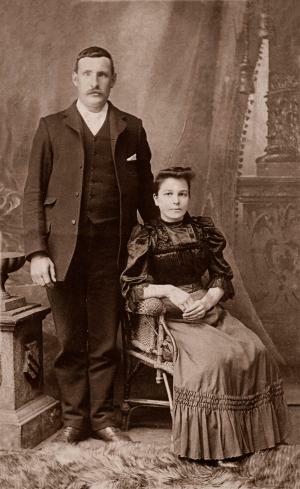 In the early 1900s, dress styles with a narrow waist (used with a corset) and puffed sleeves were popular. Details like frills, high collars, and long trains were also seen in this timeframe. 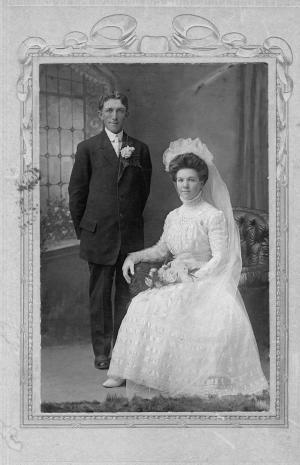 During the 1910s, brides began wearing looser dress styles. Dancing at weddings became popular during this time period, and corsets became less common. Dresses were not as lavish, though they often featured the lace, ruffles, and high collars of the Edwardian Era. Sophisticated flappers dresses with elements like dropped waists or fringe, shorter hemlines showing the ankles, and a narrowing of the skirt style were common during the 1920s. 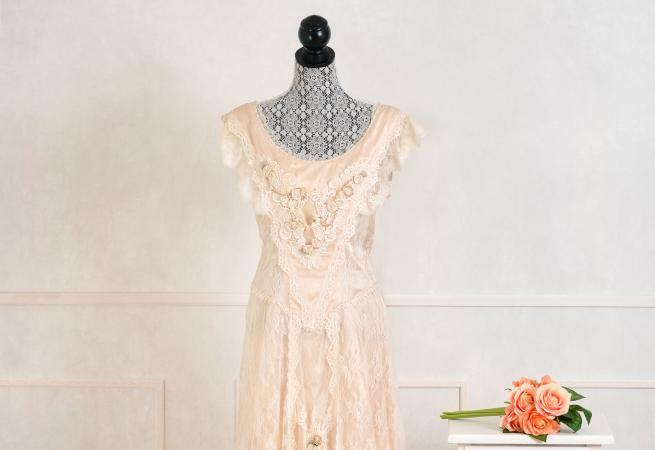 These details translated to 1920s wedding dresses, many of which also featured tucks and deep hems. Coming out of the Depression Era, dresses still had practical elements that reflected wartime necessity. 1940s dresses were sometimes made of furnishing fabrics to save money. After the war, a prosperous era dawned and wedding dresses reflected this. Formal white wedding gowns became the fashion. Shades of white, such as cream, off-white or ivory are all acceptable wedding dress colors, while bright colors such as blue, green or pink have lost favor. It was considered bad luck to get married in a black dress. 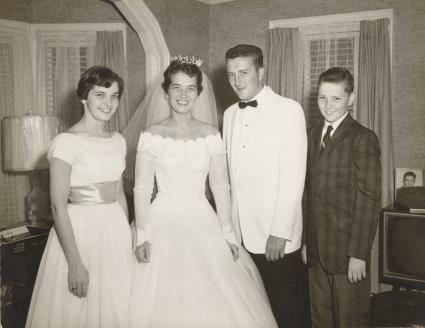 1950s wedding dresses had feminine elements like lace, and ballgown dresses gained popularity. 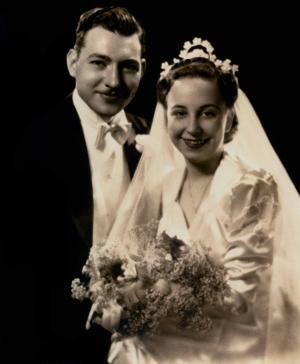 Strapless dresses and sweetheart necklines also came into bridal fashion by the later part of the 1950s. Slimmer dress styles that were more column-like, as well as rising hemlines, were hallmarks of this decade, and were seen in wedding dress styles. Dresses sometimes incorporated metallic elements. By the end of the decade, empire waists were becoming more popular and these began being featured on wedding dresses. A bohemian look was a big part of the wedding dress evolution in the 1970s. Common details included square necklines, loose or batwing sleeves, and ruffles skirt hems. Lace or chiffon maxi dresses were often worn. The excess of the 1980s found its way into wedding dresses, with princess style gowns featuring large puffed sleeves. Lace and tulle layers were popular, and dresses were often made of taffeta. While bridal attire varied in the 1990s, most dresses leaned towards sleek, streamlined styles that were contrasted the 80s look. Form-fitted dresses were popular. In the 2000s, many dress options were seen, but the A-line style gown was a popular look. Strapless gowns also increased in popularity. 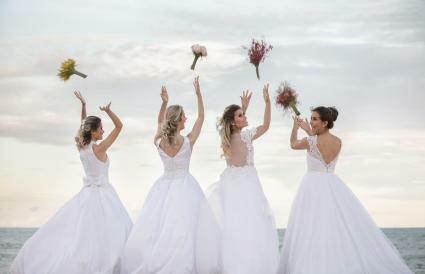 Brides continue to personalize their wedding dresses, and although white or off white remains the prevalent gown color, there are more variations. Trends have included colored accents on dresses, blush color wedding dresses, and solid-color or patterned styles. Over time, it's interesting to note the different influences on historical wedding dresses. Culture, social class, and prevalent norms all played a large part in the type of wedding dresses women have worn. In addition, royalty, aristocrats, the wealthy, celebrity style, and personal wealth or budget limitations have also influenced how women have been dressed on the day of their nuptials. Today, women are more empowered than ever before, with options for dresses that include multiple cultural or time influences, those that are inspired-by but cost less than high-end designers, authentic vintage dresses, or even informal styles that take into account the modern acceptance of relaxed weddings. 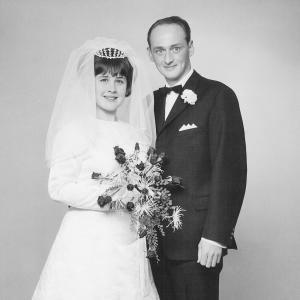 While today's tradition is often the white dress, not all brides feel bound to follow the trend. Today's bride can get married in almost any style. From an ornate designer dress to a more informal beach wedding dress, it's a given she'll look beautiful in whatever style she chooses.